Deservedly one of the most popular 5.10 cracks in Red Rocks, Triassic Sands has an unforgettable roof crux, and a super-long hand/off-hand crack that would chew you up if it were not for the abundant face holds that bring the climbing down to the 5.9 range. Which SuperTopo guidebooks include a topo for Triassic Sands? FA: Joe Herbst, Larry Hamilton, 1972. Triassic Sands was the first “real” rock climb of significant length at Red Rocks. 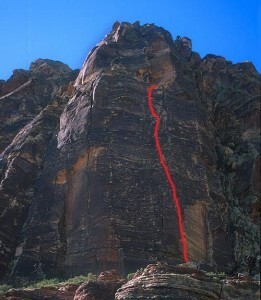 It was originally climbed as an aid route in 1972 by Joe Herbst and Larry Hamilton, as a warm-up for the Salathé Wall. One look at the wall and you can easily see that this route does not skirt the main challenges or wander through broken zones of weakness. Joe and Larry were two of the most productive early Red Rocks climbers, and together accounted for a number of serious routes including both the Rainbow Wall and the Aeolian Wall. Located in Black Velvet Canyon, Whiskey Peak Wall is packed full of amazing climbs. Lazy Buttress is an excellent pitch on Whiskey Peak. Schaeffer's Delight is a great 5.7 face climb. This steep route is across from the Black Velvet Wall.